Buy Thirty-six Bottles of AminoPure+ and SAVE when you buy Wholesale. Now You Can Feel The Benefits Of YTE® + BioPerine® + Highest-Strength Vitamin C. AminoPure+ brings the ancient benefits of Synergistic Amino Acids + Piperine + Ascorbic Acid to you… at triple the strength. Take AminoPure+ to unlock the healthy response to inflammation in your body! AminoPure+ is the highest quality synergistic formula on the planet, combining genuine Norwegian YTE® with patented BioPerine® plus the Japenese-strength and purity of Vitamin C Ascorbic Acid. Proven through clinical studies for safety and efficacy. Make the most of every bite you eat, every drop you drink, single supplement you take, with BioPerine®. AminoPure+ contains even more pure Norwegian YTE® without ginkgo biloba . AminoPure+ contains 420mg of YTE® as opposed to 400mg in AminoBoosters. Of course, our Worldwide 30 Day Triple Guarantee applies to AminoPure+ just like all the Get Your Boom! Back products. With this Money Back Guarantee you have nothing to lose. We all love to make life easy. When you choose to Subscribe & Save for an AminoPure+ Bundle, you'll get your AminoPure+ regularly without having to remember to reorder. And SAVE 8%! It's less costly for us to fulfill subscriptions, so we pass our savings on to you. Choose the AminoPure+ Subscribe & Save Option to Save Your Valuable Time With Auto Renew. Vitamin C is required for the proper development and function of many parts of the body, maintaining proper immune function, the prevention and treatment of the common cold, boosting the immune system, lowering hypertension, combating stroke, treating lead toxicity, cataracts, cancer, diabetes maintaining elasticity of the skin. Some people take Vitamin C for other infections including gum disease, acne and other skin infections, bronchitis, human immunodeficiency virus (HIV) disease, stomach ulcers caused by bacteria, tuberculosis, dysentery, and skin infections that produce boils (furunculosis). It is also used for infections of the bladder and prostate, depression, dementia, Alzheimer's disease, physical and mental stress, fatigue, and attention deficit-hyperactivity disorder (ADHD). There is some thought that vitamin C might help the heart and blood vessels, preventing clots in veins and arteries, heart attack, stroke, high blood pressure and high cholesterol. Vitamin C is also used for glaucoma, preventing cataracts, preventing gall bladder disease, dental cavities, constipation, Lyme disease, heat stroke, hay fever, asthma, cystic fibrosis, infertility, chronic fatigue syndrome, (CFS) autism, collagen disorders, arthritis and bursitis, osteoporosis, back pain and disc swelling. Additional uses include improving physical endurance and slowing aging, as well as counteracting the side effects of cortisone and related drugs. But as always with supplements, you need to make sure you're taking the right kind of Vitamin C and at the right dose. That's why we use pure Ascorbic Acid at the daily recommended dose according to Japan, where people are renowned for living long and healthy lives. When you choose to Subscribe & Save, we give you an extra 8% discount! How can we do that? Because it costs us less in handling and administration, so we pass those savings on to you. The reason why most companies don't include YTE® is because it's a very expensive, high quality ingredient. 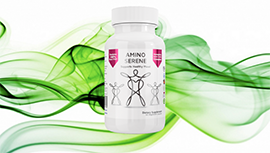 We're a small family business happy to make less margin and provide a top quality amino acid supplement with genuine ingredients at the right dose. Order your AminoPure+ Bundle today while stocks last! YTE® is a highly absorbable bioavailable source of the 23 most required Amino Acids by the human body. The human body is comprised of approximately 20% protein and Amino Acids are the basic building blocks of all proteins in the body. YTE® is a patented food supplement developed and patented by the Norwegian government and made exclusively to Norwegian standards. That was until 50 years later when a Norwegian scientist working with the Norwegian government made the same discovery as Dr. Davidson that the fertilised hen egg contained very potent nutrients on the 9th day of incubation. As nutritional and scientific understanding had advanced a lot since 1929 the Norwegian scientists understood immediately that the nutrients extracted contained a special combination of amino acids, peptides and protein fractions including a complete array of 23 Amino Acids, vitamins, minerals, proteins as well as some very important growth factors. The studies that were conducted used a daily dosage of 1600mg which is 4 tablets a day of pure YTE® powder. These other companies typically sell a 30 capsule one month supply for more than we sell a 120 capsule supply. Competitors either don't use ANY YTE® or do not declare what they use. AminoBoosters and AminoPure+ are the best priced pure Norwegian YTE® supplements in the world in the most supportive, safest, proprietary formulas. Buy Wholesale Cases of AminoPure+ and Save. Note: it costs you the same in shipping for 1, 2 or 3 Wholesale Cases of AminoPure+. We appreciate the support of our loyal customers to bring this Regenerative Formula ﻿AminoPure+ to market, in response to demand. To start “Getting Your Boom! Back” with AminoPure+ click on the big pink Buy Now button at the top of the page.